FIGHT UPDATES: AJ “Bazooka” Banal defeated Raul Hidalgo via TKO at 2:29 mark of the very first round! AJ Banal retains his WBO Asia-Pacific bantamweight belt. Banal landed strong left to the jaw of Hidalgo where the Mexican staggered and seems out of his feet which prompting the referee Danrex Tapdasan to stop the fight. Congratulations to AJ "BAzooka" Banal for the victory! Another opportunity for the ALA boxing sensation AJ "Bazooka" Banal with a professional record of 26W-1L-1D(see full box record) who will be fighting against another Mexican boxer Raul Hidalgo(see full box record) with a professional record of 15W-5L(not bad). This fight between Banal and Hidalgo is made to be not a sceptical fight unlike the Pinoy Pride XII: Bautista vs Proxy Garcia fight that deemed to be a rubbish but not constraining since it was for free to watch live fight on bohol. Banal will be defending his WBO Asia-Pacific bantamweight title against Hidalgo and we are hoping that they will not send the proxy Hidalgo just like what Mexican agent did on Bautista vs Garcia where the latter gave a garbage fight. We do hope that Mexican agents are honest for this interesting fight of Banal vs Hidalgo. Boxing experts, questioning about Banal, if he can win this fight in a convincing way, then sure he will be fighting a world title shot. In the interview, ALA Promotions CEO Michael Aldegeur said “We are not treating this as a mere tune-up.". "You can never underestimate a Mex"can fighter. Yes, AJ is nearing a title fight and we’ll assess after this fight. We are also looking at the possibility of AJ fighting on the undercard of a Nonito Donaire fight in the U.S."
According to Banal, he said "I am satisfied with the results of my last two fights. My confidence is back. I have prepared long and hard, I’ve been in the gym since December. I will not look past Hidalgo. He could be better than his record." The undercards that will showcased their talents are OPBF Flyweight champion Rocky ‘Road Warrior’ Fuentes (32W-6L-2D, 19 KO’s) of Cebu against Javier Franco (19W-6L-1D, 10 KO’s) of Mexico ,Arthur ‘El Matador’ Villanueva (17W-0L, 12 KO’s) of Bacolod City versus Rey Migreno (15W-18L-3D, 13 KO’s) of Benguet and ‘Prince’ Albert Pagara (10W-0L, 8 KO’s) of Maasin City will face his second foreign opponent in Thailand’s Phupha Por Nobnum (10W-7L-1D, 9 KO’s). The fight will be this coming Saturday night March 24, 2012 at Cebu City Waterfront Hotel & Casino, Barangay Lahug, Cebu City, Cebu, Philippines. We will try our best of our best to update here on this page, just check back always or often in this PinoyThinking Site. Just like what we did in our previous cover of Pinoy Pride Series Installment. If you want to be updated, you can subscribe here, just put your email address located on the right below of this page and click the subscribe button, thanks for joining this site. For you to watch Pinoy Pride 11:Banal vs Hidalgo, the fight will be watched here on Philippines local time only on ABS CBN Kapamilya this Sunday, March 4, 2012 starts at 10:15 am in the morning and it will be aired on the Sunday, March 4 afternoon only at Studio 23 network. We do our best for possible real time live streaming of Pinoy Pride 12 Bautista Vs Garcia Fight if there's available. If you want to see Pinoy Pride 12: Banal vs Hidalgo on live streaming or internet streaming via Philippine local TV, you can watch it also right here or on the other live TV streaming. For the Philippine TV broadcast, ABS-CBN will show the fights at 10:15 AM Sunday and Studio 23 at 12 noon Sunday, that would be March 25, 2012. For the Philippine TV broadcast, ABS-CBN will show the fights at 10:15 AM and Studio 23 at 12 noon Sunday. You can watch that on live through internet free streaming on the said date and time (Philippine local time and date) copy or click @http://pinoy-thinking.blogspot.com/2011/05/abs-cbn-live-streaming-pinoy-tv-watch.html for ABS-CBN and for Studio 23, link @http://pinoy-thinking.blogspot.com/2011/05/studio-23-live-streaming-pinoy-tv-watch.html . The complete fight results of Banal vs Hidalgo and other undercard fights will be posted right here after the fight. Visit often for more updates. 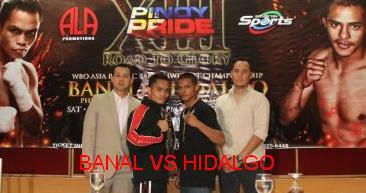 Our team will cover the Pinoy Pride 13: Banal vs Hidalgo full fight video replay. You can also watch here but the video replay will be delayed for hours or days depending to the availability but we will try our best to deliver the full fight replay. Fight updates, fight results, and others of Pinoy Pride XIII Banal vs Hidalgo fight which will be posted right through here. That's all. If you find some clerical, typographical, technical errors made in this post, just feel free to comment your post in the comment facebook form and immediately we will listen your comments as promised by our team, thanks.